It is important for natives who tend to be naive to learn some of the sickular principles and ways of working. Usually these principles are at work in the paid media coverage – the kind of coverage NDTV types do. While NDTV/IBN etc are crude, New York Times, Wall Street Journal etc are more sophisticated, but do the same when it cocerns the Hindus. 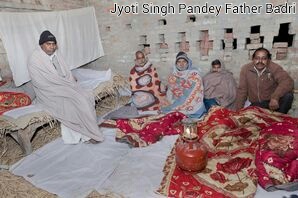 Badri, Jyoti Singh’s father was not an untypical Hindu from Uttar Pradesh – A poor guy who hard-worked his way up and had dreams for his children. 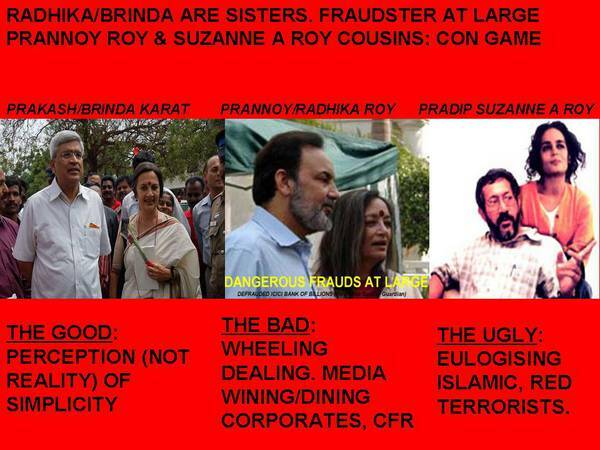 See this report that captures few facts about Jyoti Singh Pandey family. In the sickular lexicon, Hindus cant be victims. 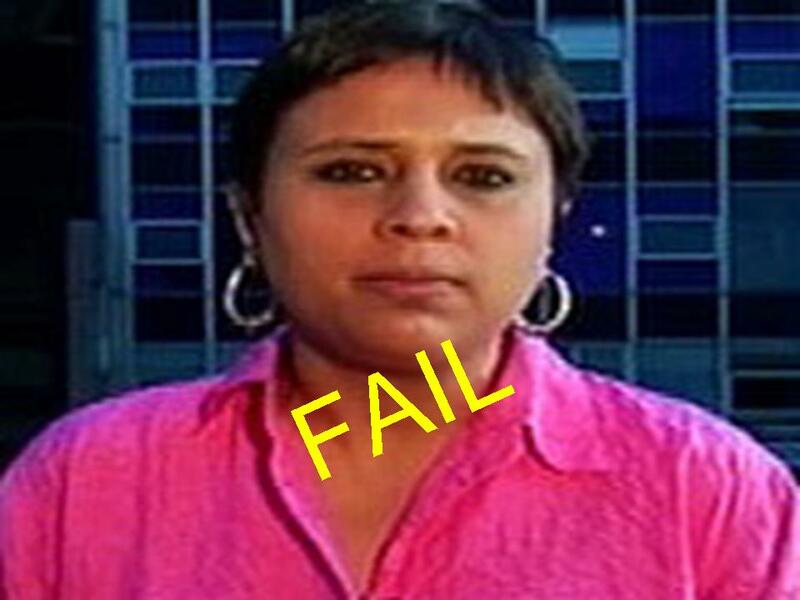 So NDTV spun out Jyoti’s name as Amanat – a moslem name – sly goebellsian deceit to subliminally push muslim victim hood. Sicko deceit principle at work here: Always deny victim hood to Hindus, but provide victim hood narrative to christians and muslims even when such claims are nonexistent. Suzanne (arundati) roy comes across as much a xn fascist as Sonia, that wears a Hindu name mask and peddles xn-red hate (liberation theology – marriage of marx & jesus). Suzanne smeared at protests as a reaction that happened only because “middle class girl” was raped. Sicko deceit principle here is deeper. Xn deceit pretends to speak for dalits and tribals that are hot targets for xn evangelization. Suzanne types deliver the xn fascist message “you will never get justice in Hinduism” so that evangelicals can come and do their bit. For these sickular crooks, “Middle Class” is code word for Hindu; And the Hindu should always be blamed for the failure of sickular despots that include x/m fascists that have mis-ruled India for long. To ensure that their failure in expanding the economic pie is obfuscated, sickos create and nurture schisms among natives. Keeping Hindu society divided is a key sickular agenda. Sickular deceit principle – use sub identities like Jati, Bhasha etc to make the Hindus fight among themselves. – So for paid media “do-beegha zameen wala” – subsistence farming Bhumihar becomes a land-lord. Sickos invent justification for hate towards such people, so that if such subsistence farming Bhumihar is killed, it is the Bhumihar victim’s problem. Powerful sickular axis of evil at the top that is setting and driving the agenda today in India includes xn, red and islamic fascist cabals. And this axis is relentlessly nurturing hate among natives. 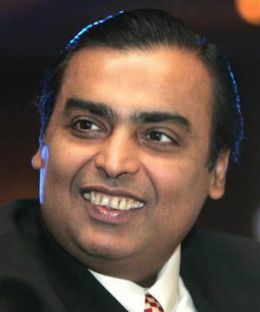 India will win only if this evil is defanged. Media is supposed to be a watch dog for citizens. In India, media is corrupted. Main reason for this corruption is control of media by those whose agenda is anti-native. This results in dangerous subversion. What people watch as news is faked reality, carefully calibrated. Sickular agenda effectively contorts what Indian people see as news. Rise of internet has broken the media oligopoly. Thanks to the online efforts of bloggers & tweeple, now more & more Indians are getting a peep into reality. This empowerment of Indian people among others was celebrated by Amitabh Bachchan, Bollywood Icon. Amitabh cited a recent article in DNA written by tweeple @Rajeevsrinivasa. Rajeev’s artcile specifically commends the work of tweeple @swathipradeep2 @barbarindian @preeti86 @sandeepweb and @atanudey for their work in de-mystifying sickular canards and exposing deceit. Now #barkhagate, #chormedia, #ibnlies, #mediamafia #radiamedia are part of lexicon. Indian Government propagating rogue notions of sickularism failed to provide security to Hindu people. Supreme Court was appalled this week that the Govt provides only verbal commitments and no concrete relief to Kashmiri Hindus. 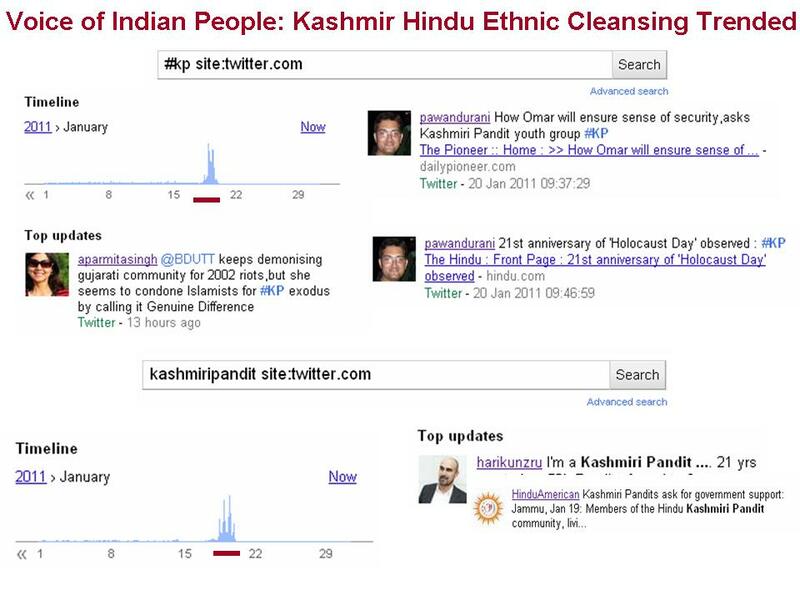 Native Indian people discussed online ethnic cleansing of Hindu people in Kashmir. They even made this major onlne trends while organized sickular media mafia was muted and provided hardly any coverage on the event.